In 2018, smartphone shipments are expected to reach 1.475b and the display shipments are forecast to reach 1.665b as panel makers generally sell 10% to12% more displays than OEMs sell phones to make up for breakage, timing differences and the mix. The next chart shows the mix of smartphone displays by technology and OEM. Samsung and Apple will ship 87% of all flexible display based smartphones and no other OEM has more than a 5% share (OPPO). OPPO and Vivo have the highest share of shipments that use OLEDs in China each at 35%. Samsung mobile has the highest use of OLEDs at 73% with Apple #2 at 37%. In terms of panel size, the panels are divided into the 6 categories with categories with 5.5-5.9” having the most displays at 614m, followed by >5.9” at 462m and 5.0-5.4” at 260m. 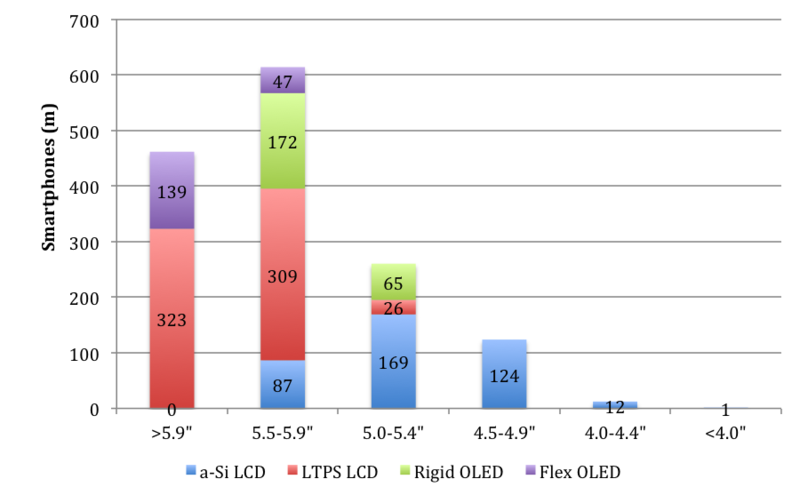 In terms of technology, LTPS LCDs occupies the #1 position at 45%, followed by a-Si LCD at 27%, rigid OLEDS at 16% and flexible OLEDs at 13%. OLED panel makers are looking to take share from LTPSs LCD in the 5.0” and larger category to take advantage of 1) comparable costs for rigid OLEDs, 2) unique form factor for flexible displays and 3) the upcoming introduction of foldable displays. 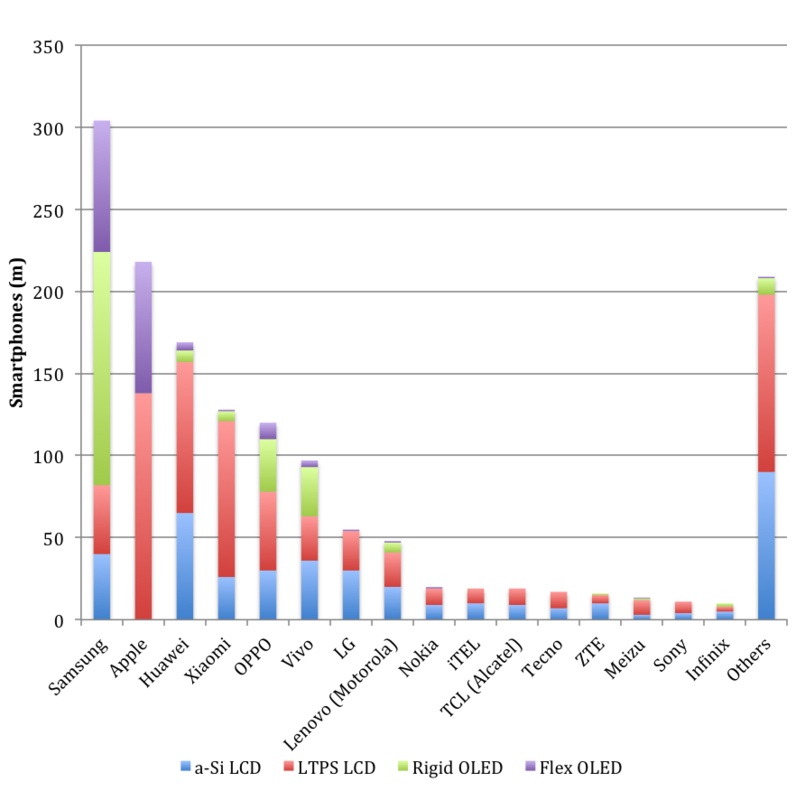 It is also quite unlikely that OLEDs will target the low end of the market currently held by a-Si LCDs, which are built in older fabs, carry very low prices >$10 and cannot support high pixel densities. Should the industry move to an oversupply condition, which is highly likely if the Chinese OLED panel makers carry out their plans and achieve reasonable yields, they would target the LTPS LCD made by JDI, LGD and Sharp rather than the low margin and performance a-Si LCDs. 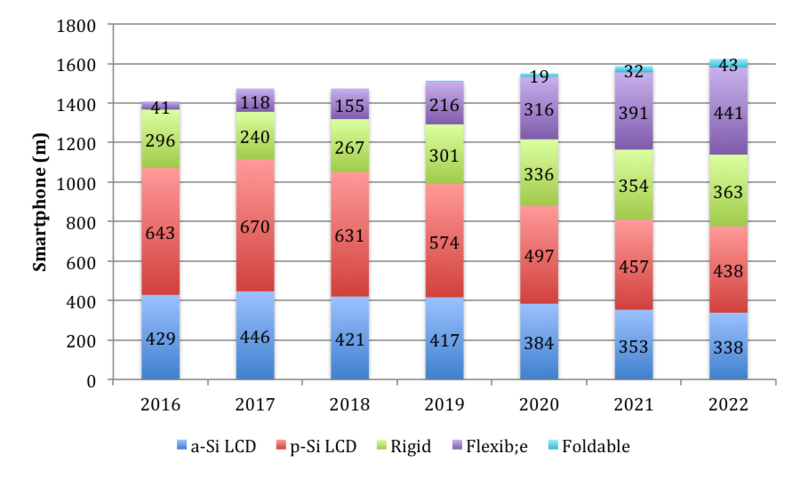 The next chart shows a forecast of panel shipments by technology with OLEDs replacing LTPS LCDs. Total OLED smartphones could reach ~800m in 2022, up from 420m in 2018. Note: The actual number of panels shipped would by ~11% more or closer to 900m.